The applicant travels at 10km/h or more below the speed limit for a substantial part of either stage. The applicant stops unnecessarily before driving through a pedestrian/children’s crossing when there are no pedestrians on or approaching the crossing. The applicant is not penalised for travelling at 10km/h or more below the limit for a substantial part of the stage if conditions (e.g. wet or unsealed road, or in congested or slow traffic) make it unsafe to travel closer to the speed limit. Driving too slowly is also recorded using the Task Assessment Item (Speed Choice), which is assessed for some tasks in Stage 2. Drivers who unnecessarily stop or travel too slowly increase traffic congestion and frustration to other drivers, potentially leading to unsafe behaviour by others. This item should only be recorded once in each stage, if relevant. Before pulling out, the applicant does not check the mirrors and head check. Before diverging by at least a car width, the applicant does not check the mirrors and head check. When fully or partially changing lanes, the applicant does not check the mirrors and head check before crossing the lane boundary. When required to give way, the applicant fails to look for traffic before going. When turning or diverging (including changing lanes or pulling out), if the applicant fails to give way causing a road user to take evasive action, an Immediate Termination Error (Fail to Give Way) is recorded. Observed behaviour: The applicant turns left at a Give Way sign. There is no conflicting traffic, but she approaches and turns at a speed that would make it impossible to assess potential hazards or conflicting traffic. 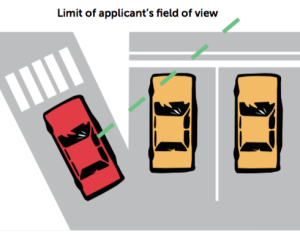 Assessment: In a situation where the applicant would be required to give way, she must visually check for traffic. Her speed during the turn was such that it would not be possible to assess potential conflicts. A Critical Error (Fail to Look) should be recorded. Observed behaviour: The applicant intends to proceed straight ahead through a cross- intersection controlled by a Stop sign. He stops correctly at the Stop sign, checks for traffic from the right, but fails to check for traffic approaching from the left before proceeding. There is no traffic approaching from the left. Assessment: In a situation where the applicant would be required to give way, he must visually check for traffic. A Critical Error (Fail to Look) should be recorded. Before pulling out from a parked/stationary position, the applicant fails to signal. When diverging to stop at the kerb or roadside, the applicant fails to signal. Before diverging by at least the width of the car, the applicant fails to signal. When fully or partially changing lanes, the applicant fails to signal before crossing the lane boundary. A Critical Error (Fail to Signal) isn’t recorded if an applicant doesn’t signal before leaving a roundabout where practical. Record a No for Signalling if during an assessable task. If the applicant signals when required but not correctly (e.g. the signal is not activated soon enough or is cancelled too soon), a Critical Error (Fail to Signal) should not be recorded. No should be recorded for Signalling if during an assessable driving task. When turning/diverging (including changing lanes or pulling out), if the applicant fails to give way causing another road user to take evasive action, an Immediate Termination Error (Fail to Give Way) is recorded. Observed behaviour: The applicant turns right from a right-turn-only lane without giving any turn signal. No other road user takes evasive action. Assessment: A signal is always required when turning, regardless of the lane markings or the presence of other road users. A Critical Error (Fail to Signal) should be recorded. The applicant stops partly on a children’s, pedestrian, or marked foot crossing. If more than 1 vehicle is queuing to make the turn, this exception applies only to the first vehicle in the queue (see Figure 25). Before stopping on the crosswalk, the applicant must take all reasonable care to ensure that no pedestrian has to take evasive action. If the applicant stops the vehicle at a position that intrudes onto or blocks a pedestrian crosswalk and a pedestrian takes evasive action and the above exception does not apply, an Immediate Termination Error (Stop at Dangerous Position) is recorded. For the safety of pedestrians a driver should not stop a vehicle in a position that blocks a children’s, pedestrian, or marked foot crossing. However, in some cases (e.g. some left-turn slip lanes) it may be necessary for the first queued vehicle to stop on the crosswalk if an adequate view of approaching traffic cannot be obtained before the crosswalk. Victoria has introduced an amendment to the Road Rules to prohibit stopping on crossings except under such special circumstances. Figure 24: Stopping before the crosswalk may not provide an adequate view of traffic approaching from the right. 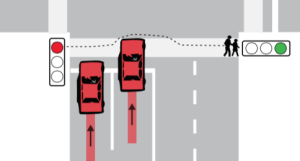 Figure 25: The second queued vehicle should not encroach on the pedestrian crossing until the first has departed. While entering or leaving a parking space or performing a 3-point turn, the applicant allows 1 wheel of the vehicle to mount the kerb. If, while entering or leaving a parking space or performing a 3-point turn, 1 or more tyres contacts the kerb but not heavily enough to cause discomfort to occupants and without mounting the kerb, no penalty is recorded. If more than 1 wheel mounts the kerb, a road user takes evasive action, or there is danger to property, an Immediate Termination Error (Collision) is recorded. The applicant stalls the vehicle at any time during the test. If the applicant requires physical or verbal assistance to start or re-start after a stall (or at any other time), an Immediate Termination Error (Intervention) is recorded. Stalling the vehicle can lead to potentially dangerous conflicts with other traffic. At a Stop sign, the applicant slows but fails to bring the vehicle to a complete stop (with the wheels motionless) behind, but within 2m of, the stop line. At a Stop sign, traffic lights or children’s crossing, the applicant stops with part of the vehicle beyond the stop line, but the vehicle does not intrude into the pedestrian crosswalk (see Figure 26). If the applicant drives past a Stop sign without clearly demonstrating an intention to stop, an Immediate Termination Error (Fail to Stop) is recorded, regardless of whether there is any conflict with other traffic. This Critical Error should not be used if the incomplete stop occurs at a railway crossing. If the applicant fails to completely stop in the correct position at a rail crossing when required, record an Immediate Termination Error (Fail to Stop). If the applicant does not stop at a red traffic light (or associated stop line), an Immediate Termination Error (Fail to Stop) is recorded. If the applicant stops beyond the stop line and the vehicle intrudes into the pedestrian crosswalk, but no pedestrian is affected, a Critical Error (Block Pedestrian Crosswalk) is recorded. If, when stopping at a Stop sign, traffic lights or children’s crossing, the applicant fails to complete.y stop behind the stop line, and as a result creates a conflict with a pedestrian or an approaching vehicle, an Immediate Termination Error (Stop at Dangerous Position or Fail to Give Way) is recorded. Observed behaviour: The applicant slows when approaching a Stop sign and comes very close to a complete stop at the appropriate position while giving way to a vehicle. Assessment: The applicant has failed to come to a complete stop with wheels motionless. A Critical Error (Incomplete Stop) should be recorded. Observed behaviour: The applicant approaches a Stop sign and stops with the front of the vehicle projecting 0.5m beyond the stop line. Due to the presence of a parking lane on the intersecting road, no conflict is created with vehicles on the intersecting road. Assessment: The applicant has stopped, but failed to come to a complete stop at the appropriate position. A Critical Error (Incomplete Stop) should be recorded. 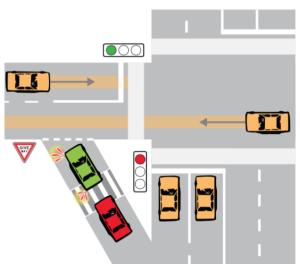 Figure 26: The vehicle on the left stops over the stop line, so a Critical Error (Incomplete Stop) is recorded. The vehicle on the right blocks the marked foot crossing, causing pedestrians to take evasive action, so an Immediate Termination Error (Stop at Dangerous Position) is recorded. If a Critical Error (Other Illegal Action) is recorded, the LTO must also record the nature of the illegal action on the score sheet in the space marked ‘OTHER ILLEGAL’. The applicant performs an illegal action not specified under any Critical Error. If the applicant gives a turn/diverge signal that starts too late or finishes too early, a Critical Error (Other Illegal Action) should not be recorded. No should be recorded for Signalling if the task is assessable. However, if a required turn/diverge signal is omitted, a Critical Error (Fail to Signal) should be recorded. drives for more than 50m on (or partly on) the wrong side of the road. For all other breaches of the Lateral Position requirements, a Critical Error (Other Illegal Action) should not be recorded. If, when pulling over at the end of Stage 1, the applicant stops very close to (but not blocking) a driveway, a Critical Error (Other Illegal Action) is not recorded. Observed behaviour: The applicant turns right from a lane marked for straight-through traffic only. No other road user needs to take evasive action. Assessment: Disobeying arrows painted on the road surface contravenes the road rules. A Critical Error (Other Illegal Action) should be recorded. Observed behaviour: The applicant turns right from a lane marked for straight-through traffic only. 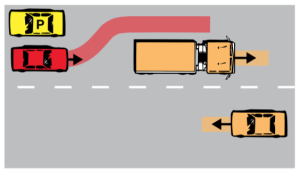 A vehicle in the lane to the right must slow down to avoid a collision. Assessment: Because a road user had to take evasive action, record an Immediate Termination Error (Other Dangerous Action), not a Critical Error (Other Illegal Action). Observed behaviour: The applicant approaches a green traffic signal, which turns yellow while the applicant is still far enough away to stop safely. The applicant proceeds through the intersection while the signal is yellow. No other road user is affected. Assessment: Drivers are required to stop at a yellow traffic signal if they can do so safely. The applicant has failed to comply, record a Critical Error (Other Illegal Action).